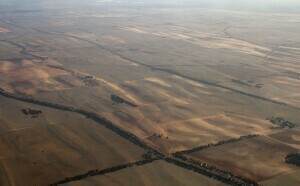 Landscapes with closely spaced east-west dunes occur in several parts of the northern Mallee. 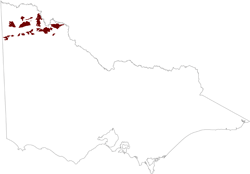 Most occurences lie on either side of the Sunset Desert, and together with this desert form the bulk of the Sunset Country, a large uncleared area between the Ouyen-Murrayville and Millewa settlements, now incorporated in the Murray-Sunset National Park. This park contains a wealth of diverse ecosystems. Occurrences of the unit tend to be elongated east-west, with clear boundaries to adjacent units. The largest area occurs to the north of the Sunset Desert, extending from the Noora Depression across the Millewa Ridge to the Raak Plain. The unit also separates the Raak Plain from the riverine Hattah Lakes area. Several areas extend further east, reaching the River Murray at Boundary Bend, and some of this land is cleared for agriculture. The unit crosses both tectonic ridges and major depressions. Stranded ridges are few in the depressions but frequent on the Millewa Ridge. This 'virtual tour' is in an area just south of Underbool. On the left hand side of the image you can see linear calcareous dunefields that trend in an east to west direction. This area has been cleared for agriculture and mainly supports grain cropping. The area to the right is on the northern edge of the Big Desert National Park and is dominated by native mallee vegetation. The landforms here are dominated by siliceous dunes that are parabolic in shape. This is an interesting area that clearly shows these two distinct dune formations abutting each other sharply. We have detected that the browser used to view this content is missing the supported 'Flash Player plugin'. You need to install the Adobe Flash Player to see this video. The dunes tend to be longer and the crests sharper than linear dunes elsewhere on the Woorinen Formation. They occupy about three-quarters of the landscape, with deep upper horizons of reddish-yellow, loose sand. Samples taken near Hattah showed fine sand to exceed coarse sand, the reverse from other dunes examined in the region. Dune cores are compact reddish clayey sand to sandy clay loam. The vegetation is dominated by small mallee with a prominent understorey of Spinifex (Triodia scariosa). The tall shrubs Broombush (Melaleuca uncinata) and Tea-tree (Leptospermum coriaceum) are sometimes prominent on and near the Millewa Ridge, representing their northern limit in Victoria. Most swales also have surfaces of sand, again supporting mallee with Spinifex understorey. However some parts of swales have medium-textured Calcarosols with abundant subsoil carbonates. These heavier swales support taller mallee with a sparse ground layer. The predominance of sand indicates that the parent sediments were sandy, possibly including material stripped from the soil developed on calcareous loess. Radiometric imagery shows a tendency for the dunes to be bunched into lobes, suggestive of eastwards movement, and of encroachment over other materials such as saline deposits on the Raak Plain, alluvium near the River Murray and heavier materials of the Woorinen Formation. Such dune migration has not occurred in the other units of the calcareous dunefields. All these factors suggest that the development of these particular dunes was not triggered by salinity. The sands would have been sufficiently prone to saltation to move when vegetative cover was reduced during arid phases. Susceptibility to erosion and low fertility reserves limit agricultural uses. Salinity hazards are low. An aerial photograph show Linear dunes dominant. Photo taken shows an area to the north, south and east of Sunset Desert.